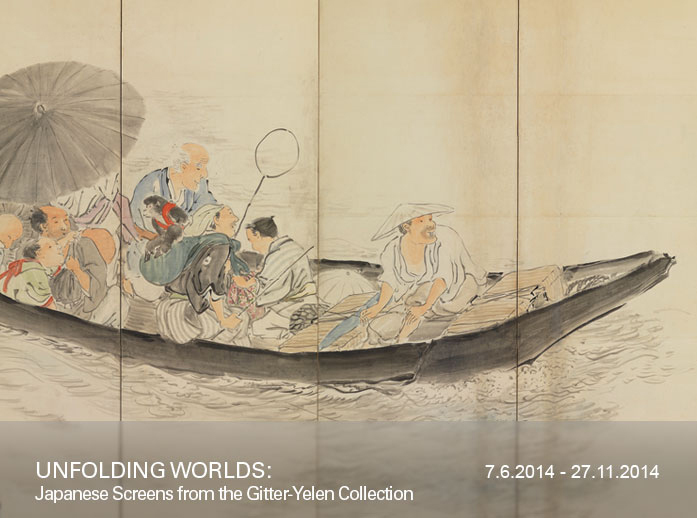 Poster of the exhibition Unfolding World: Japanese Screens from the Gitter-Yelen Collection. The exhibition “Unfolding Worlds: Japanese Screens from the Gitter-Yelen Collection” presents for the first time in Israel a group of exquisite Japanese screens from the Gitter-Yelen Collection, world-renowned for its quality, which illustrate the richness of Japanese art. The eighteen screens on display date from the 18th to the 20th century, and reflect the range of topics covered by Japanese artists, as well as the cultural attitudes and ideals of the different time periods. Landscapes, the passing of the seasons, urban scenes, and mythological themes are all depicted in elaborate detail, measured paint strokes, and spectacular composition.